Game Night: Gloom | Warped Factor - Words in the Key of Geek. I come from a family of misfits, and if you find yourself in control of one such family, striving to make everybody suffer the greatest tragedies possible before helping them to die, then I hope to God you are playing Gloom - otherwise you need some serious help, and/or a coat with the extra long sleeves and many, many buckles. Gloom is a fantastic game, it’s small so fits in the handbag category, but it steps from there into the storytelling category. Set up for 2 to 4 players, this game is literally aimed at doing what I hinted at in the first paragraph. You make every character as miserable as possible, then you kill them. The most miserable family wins. Angel - Starry-eyed serial killer - Angel’s always had a hankerin’ to go to the big city… and kill someone. Butterfeild - The Lurking Butler - Whatever it is, he did it. Melissa Slogar - Cadaverous Child - It’s a shame when a child dies at a tender age, but sometimes, it’s a shame when she doesn’t. There are four types of cards, characters, modifiers, events, and untimely deaths. Modifiers give or take pathos points, event cards let the player do things in their turn - or stop another playing doing something. And untimely death cards, not surprisingly, kill characters. One of the things you should know about these cards, is that they are beautifully (and weirdly) made. These cards are all transparent plastic and you literally lay one on top of the other - this is how at the end the players can add up (well subtract - this is about making people feel the gloomy negative remember) how many pathos points they have. 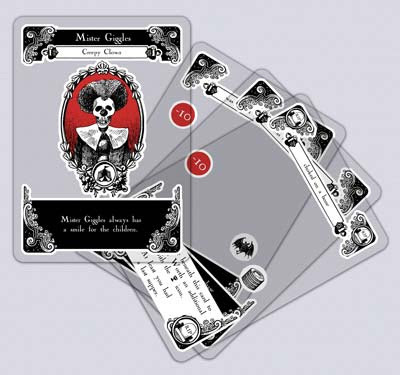 Play is fairly simple, you start with your five characters alive and draw five cards from the shuffled deck - face down of course, you don’t want to see what’s coming! Then you take turns in trying to make your family miserable and miserably dead, whilst making other families either happy or dead before they are too miserable, but watch out, play ends when one family is all deceased. But the all important and most fun part of this game to me is how you play it. For each card you lay down, you have to tell the story of that card. So, for example, as I write this, the deck card in front of me is a modifier that says “was startled by snakes … not to mention being vexed by vipers and angered by asps.” But in order to play that card I have to tell the story of how the character came to be startled by snakes. Perhaps Cousin Mordecai visited the Dark’s circus and fell into the snake pit, or did Goody Zarr, the nefarious nanny, place them in the beds of the Wellington-Smyth twins, the sweetest demonically possessed sociopaths you’ll ever meet? Or is there some other explanation? Well there’s bound to be, and it all works especially well if you can link the card you’re playing up with the card that was previously played on the character you’re about to torture. The real limits of this game are actually in the imagination of the players, and often it’s the play that’s more worthy than the winning. Tell the story well and you won’t care if your family lives or dies. One of the other good things about Gloom is that is actually supplies you with ways to modify it. If you want a shorter game, start with four family members each rather than five. Or set a time limit. There’s nothing like misery for deadlines. The other thing I like about this game is that it doesn’t exactly stand alone. There are expansions, which add families, so you can increase the number of game players, and there are alternatives. 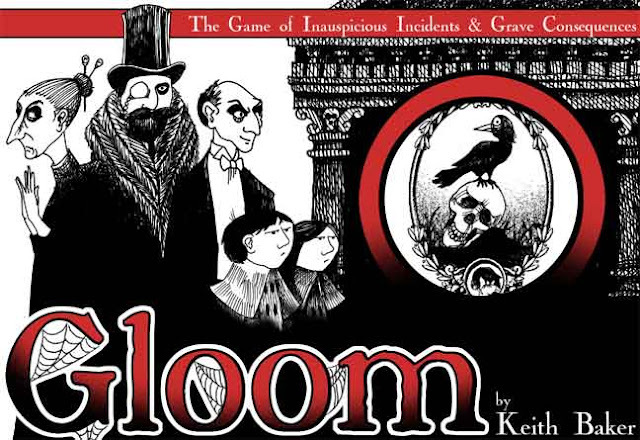 I have the original Gloom, but I also have Cthulhu Gloom, where you have to drive people mad before you kill them. If you are at all familiar with Cthulhu, you won’t be surprised by Innsmouth, Arkham or the Miskatonic University, but you might be surprised how crazy play can make you. There’s Fairytale Gloom, the Unquiet Dead, Unfortunate Expeditions and Unwelcome Guests, so plenty to dig in the dirt about. So go on, gather the family and make someone Gloom-y tonight.